Holy moly!! that looks and sounds sooooo good! i have none of those coconut ingredients, though :( but why dont youjust make me some and I can come over and eat it :) we can watch jersey shore together while we munch!!! ohhh man!! I will need to try that ASAP!!! Looks SO delicious! My daughter loves coconut!! I actually have everything but the coconut butter, but I’ll just sub regular. Hilarious! Once again. 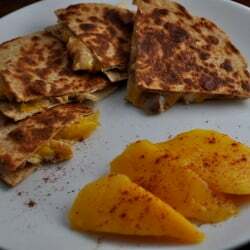 And that pic seriously just gave me a foodgasm. It looks delicious! Beyond. Really. Ok, I’m stopping here..
Ummm can I just say that you’re freaking hilarious?? The combination of delicious recipes and your humor is….well…EPIC. Sign me up! Coconut’s #1 fan right here! 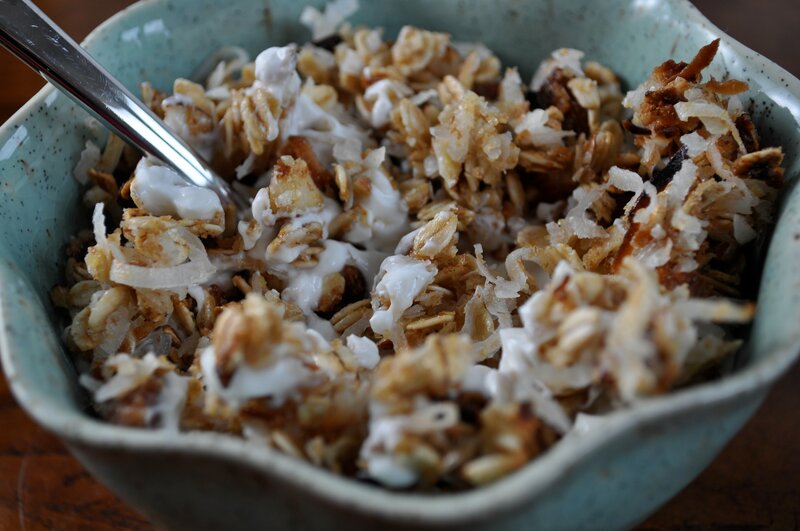 Unsweet or sweetened coconut shreds? I almost always have both on hand. Either works! I love coconut too! This looks AWESOME!!! MMMM I love coconut and granola, so coconut macaroon sounds amazing. your house has GOT To be off the chain good smelling after making this stuff…omg yum! That, as always looks delicious. I have a problem when it comes to coconut too. I love the taste, I love the smell, I just love it. I’m with you…coconut can’t really get any better. Unless you combine it with sugar and carbs. I want a snack bag full of granola with me next time I go shopping, too. I don’t know how many times I’ve sat hand-to-mouth from a granola bag as well. That stuff is lethal! I am in absolutely in love with coconut too. There is a place in DC called Z-burger that makes a delicious Mounds shake. It seriously taste exactly like a mounds bar and being a huge coconut and dark chocolate = pure heaven for me. You had me at coconut. I seriously could not be trusted around this either. Holy yum!! oh wow. WOOOOW! I’ve always had an affinity for coconut/coconut flavored items, but lately it has become an intense obsession. I think this little recipe is just what i need to fuel the obsession! hehe THANKS! Ha! Jersey Shore marathon. You are hilarious. Coconut is a flavor that I never tire of…yum! I’m so mad at you for posting this…NOW I HAVE TO MAKE IT!! I love reading your posts, you always make me laugh! That granola sounds so good! 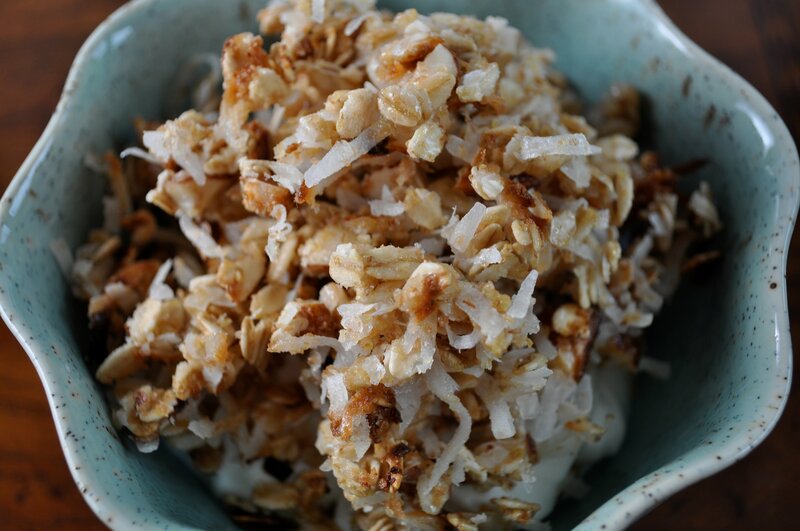 I didn’t have vanilla bean (doubled the extract), coconut extract (used almond instead) or coconut butter (used coconut oil) and still this granola was INSANELY good!…and I’ve never considered myself a coconut lover. Just the right amount of sweet, salt and crunch. I devoured it by myself in 2.5 days – my rationalization was swimming a mile yesterday and biking for 22 miles today to mitigate the damage to this grandma’s thighs. Problem is, my granola is GONE and I am craving MORE. Thanks for a great recipe, Jessica. I am really enjoying your humor. I made a batch of this yesterday and walked into the kitchen shortly after to find my husband, 4-year old son and 2-year old son shoving fistfuls of it into their mouths. I suspect I will have to make another batch today. SOOO good. hehehe so glad it was a hit! I say YES to this! Hi! I had a problem with the coconut burning, which is pretty much always the case with sweetened coconut. It’s not clarified in the recipe what kind to use, so I’d recommend to anyone making this with sweetened to stir it in after baking. If you’re going to use un-sweetend, you’ll probably be ok baking with it. Looks amazing…. Could a person add cocoa powder in the mix and dark chocolate chunks after cooking to cater to the coconut-chocoholic in me?